There are a dozen variations of the “Pot Roast Parable”. This story presents so many lessons. When I first heard it, it made me think about things I might do without questioning. One thing I realized not very long ago has to do with milk. I grew up in a family where we took the ice-cold milk out of the refrigerator and shook it good and hard before opening it to pour a glass. The cold, white, bubbly goodness went perfect with a warm, homemade cookies fresh from the oven. 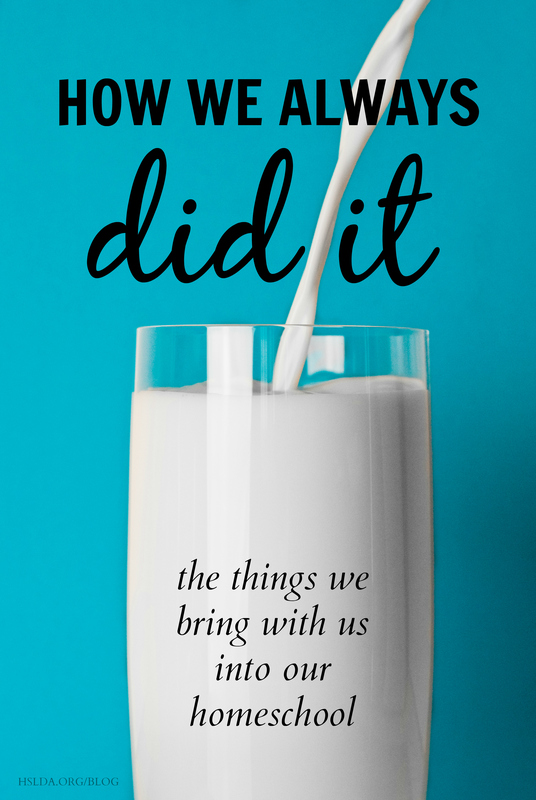 For the majority of my life, I drank pasteurized, homogenized milk, and never questioned why we shook it up until several years ago when my husband and I started buying raw milk from a small family farm in Pennsylvania (where it is legal). The cream in non-homogenized milk separates from the milk and unless you want to pour a big glass of thick cream, you shake the jug so the two incorporate into the perfect glass of milk. I had an epiphany one morning as I stood in the kitchen shaking the jug of milk. I’d done it my whole life, even when the milk we were drinking wasn’t separated. I realized that this habit had likely been taught by my grandparents to my parents who taught it to me, and though it had become unnecessary, we still did it because it’s “what we always did”. There are a lot of things we do not question that we bring with us into our homeschool. One of the first and earliest that I remember challenging was getting my kids up early as if they had a bus to catch or a carpool to meet. Two of my three children came from birth with circadian rhythms that seemed to have energy peaks in the late evening. It was during this time that they became curious, creative and engaging. Over the course of time, I learned to let go of my idea of how it was “supposed to be” and let our lives find a routine that was more in sync with our natural inclinations. It took me a while to adjust. I found that rather than having time to myself at night after the kids went to bed like most parents, I was able to adapt so I could have that same time of uninterrupted Bible study, reading, bill paying, blogging, etc. in the morning before they got up. Going to bed at a later hour meant they slept in later in the morning. Though it wouldn’t have worked well for everyone, the flow of our household routine worked well for us. Like anything that goes against the grain of how the majority do it, there were people who asked me questions like how my kids would be able to fit into society or how they would be able to get up in time for college or a job. Both of my daughters have gone to college and they were seldom late for a class, unlike many of their peers. My oldest daughter is a mother who is able to manage the needs of her child – late nights, early mornings and the like. My teenage son has a job that he loves and he is usually the first one there. Allowing our homeschool schedule to operate in a way that worked well for us did not cripple them for their futures, which are now the present. Letting go of the idea of what should be and the way we always did things can bring beautiful harmony and balance to your household. Photo Credit: Photos taken by Krzysztof Puszczyński, graphic design by Charity Klicka.